Your LSO Board met and decided to have Pat Tesche serve the group as the LSO Interim Chair, based on Bob LeClair's untimely death. (See below). Pat served admirably until late 2011. Bill Koffel, FSPE volunteered to be Chair and has served in 2012 and 2013 the LSO's needs as leader. as an organization, your Board has established a LSO Membership Structure, formed the LSO 501c6 Not-for-Profit Corporation, organized member benefits, held 2 Conferences, 3 Webinars and launched this website during its existence. The group has started planning 2013's efforts as well. LSO Committees have formed with Pat Tesche, Education, and Tony Fontana, Research. Membership makes the difference - This group is already very dynamic, and will bring great value to fire and life safety in buildings. Join LSO now to help steer the direction of this important group. Sad News - LSO was saddened to hear of Bob LeClair’s untimely death on May 4, 2011. We had just seen him in New Orleans the week before. 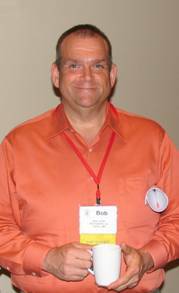 Bob was founding Chair of the Life Safety Organization, and active at FCIA, IFC, and other industry organizations. He was well known for his passion for the firestop, fire and life safety industry. He was FCIA President in 2005, active Co-chair of the FCIA Code Committee, member of the FCIA Program and Life Safety Digest Committee, and the 1st Chair of the Life Safety Organization. For those who knew him well, they will never forget his unselfishness, volunteering spirit and dedication to family and friends. He will be missed by all. Bob leaves behind his wife Beth, and his young sons David, Robert and Joshua. A ‘Family Fund’ has been established for his loved ones. I would like to that this time to commend Bob LeClair’s vision in developing the Life Safety Organization (LSO). Upon Bob’s untimely passing, fellow Board members nominated me to serve as LSO Interim Chair. My goal as Interim Chair is to lead this organization and continue on the path Bob started. Our goal is to create a world class organization focusing on education, research and advocacy. What happens next is each member is going chose one of two roads to follow. Each of us must choose our level of involvement in the organization. Like many people who join an organization, they will attend conferences and take advantage of some resources. A few take the path less-traveled by joining a committee or otherwise do something more with the organization to help reach our goals. In some way, shape, or form, my involvement in LSO is invaluable to me; my business, as well as my professional development. What I discovered as I stepped up is that I grew as a person, got to know members from different disciplines within Fire Protection; understand each other’s business and gain the trust enough to want to do business with and refer business to each other. That’s when the magic of membership happens.It going to take a little time, but it will be worth it. We are a new organization which is going to be a true Life Safety Advocate dedicated to the Total Balance Approach of Fire and Life Safety. I am asking all of our members to do a little more with LSO. Each of you are already very busy running a business, not to mention a busy family life; yet I am confident that the rewards of getting involved will enrich the other areas of your life. Attending our conferences, educational seminars and networking events bring value; however, I don’t believe you will realize the full benefit of the LSO without getting involved. Align your goals and your strengths with our organizational needs. There is a place for each of you to shine. It doesn’t need to be a big commitment or time-consuming endeavor. There are many of small tasks to be done, too. If we all get involved in LSO, big or small, we all benefit. As Chair, and along with the leadership from our Board of Directors, our goal is to tap into each of your skills, and ask you to do a little more this year. Which every road you choose, our organization will help each of you find your place in the LSO. Contact the LSO office at 708-202-1497 for more information about the 'LeClair Family Fund' or email linda@lifesafetyorganization.org. We wish his family the best during this difficult time for them, and his many friends in the industry. His passion for all life brings and friendship will missed. LSO Education Webinars bring knowledge to your office with no travel expense! Watch the home page for dates.